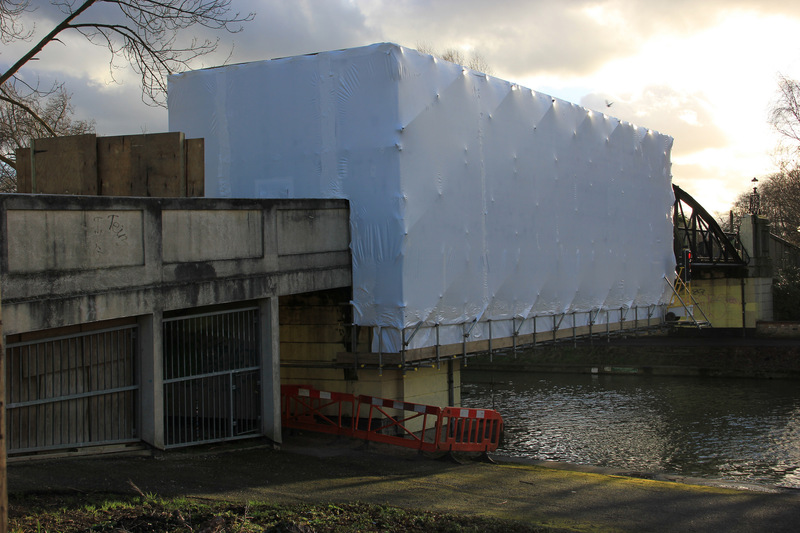 Rhino Shrink Wrap were approached by TrueForm Scaffolding Ltd. to provide full encapsulation of a scaffolding over a bridge spanning the Lower River in Cambridge, UK. The entire structure of the footbridge required shot blasting and painting. Due to weigh restrictions on the bridge, the project was planned so that half of the footbridge would be scaffolded and shrink wrapped in two phases. We used our signature Rhino Verisafe® 300 micron shrink wrap film for this project. This wrap, which is flame retardant to the EN13501 standard is supplied as a 7m wide x 15m long roll. Shrink wrap sheeting is particularly advantageous for shot blasting and painting applications because joints between individual sheets of shrink wrap are heat welded using a propane gas hot air gun to create a continuously bonded skin over & around the scaffolding structure. This seal makes creating environmental containment much easier whilst the ‘drum tight’ fit means that the shrink wrap sheeting does not tend to flap and self destruct like traditional sheeting products. This means the sheeting can be relied on to provide weather protection and temperature control during the painting phase of the project without requiring frequent maintenance visits. 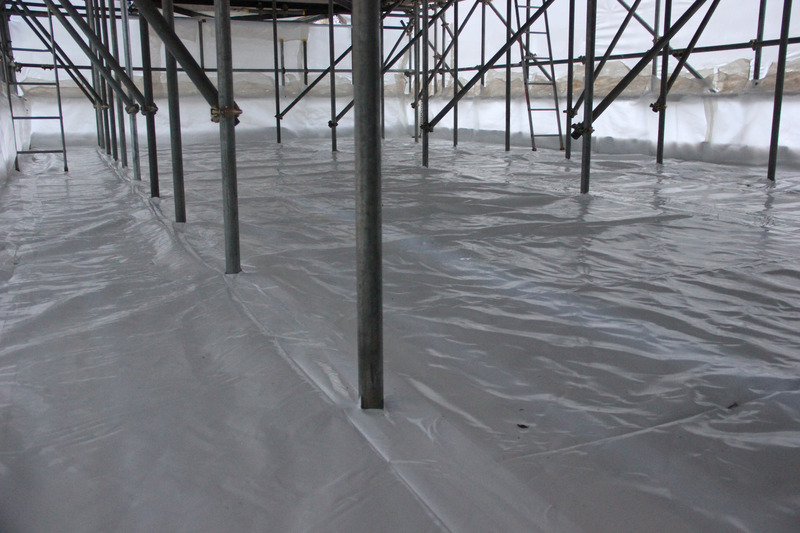 Rhino’s team of three installers completed around 500 square metres of encapsulation in under 2 days. The Rhino installation team step began by hanging the shrink wrap sheeting around the side elevations of the scaffolding. This sheeting was battened around the perimeter of the roof and dropped 30-40cm past the lowest hand rail. The shrink film was wrapped around the hand rail and heat welded back on to itself to provide a lower anchor point for the sheeting. 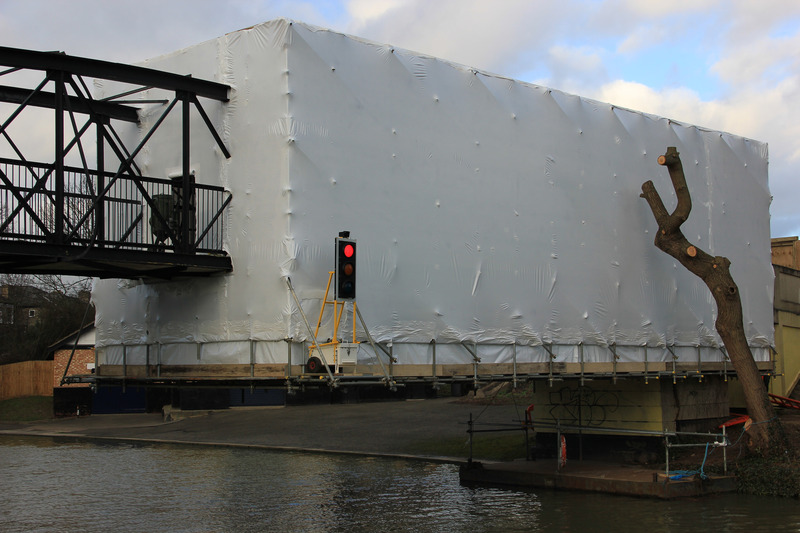 Where possible, joins between sheets were planned to occur at the point where protrusions, (such as the bridge structure) passed through the shrink wrap to minimise the amount of cutting and resealing required. The shrink wrap roof sheet was then fitted and overlapped and welded to the side sheets. Once the main part of the structure had been covered and heat shrunk drum tight the Rhino team were able to move on to creating the ‘final seal’. TrueForm scaffolding provided a boarded platform suspended beneath the footbridge. Rhino laid the shrink wrap sheeting over the boards and heat welded this floor sheet to the side sheets previously installed. TrueForm then laid another floor of scaffold boards on top of the shrink wrap so that the sheeting was protected. 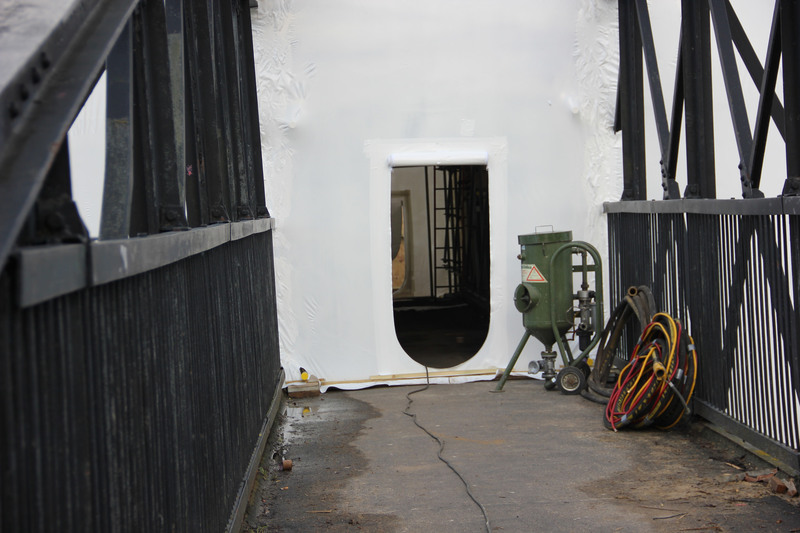 The final stage was to install a zipped access door which allowed workers to access the blasting and painting area whilst full encapsulation was maintained around the project. Cutting around the bridge structure whilst maintaining a seal for shot blasting work. Working around the weather. In the middle of installation, when a large storm was forecast, our teams went in early to complete the work and keep the project on schedule. Although a fairly small project, the success of this project was due in large part to TrueForm Scaffolding. By building the scaffolding structure flush and by provided a fully boarded floor and roof, our installers were able to easily install the shrink wrap sheeting and achieve full encapsulation ready for the shot blasting and painting teams.